Tomales Bay, just north of San Francisco on the California coast, is a narrow inlet of water sheltered by a thin stretch of land. The tip of that land, facing out to sea, is Tomales Bay Point — a peaceful place to experience the natural beauty of Point Reyes Seashore. Known for its fresh oysters and shellfish, Tomales Bay is a scenic spot separating Point Reyes Peninsula from the mainland of Marin County. 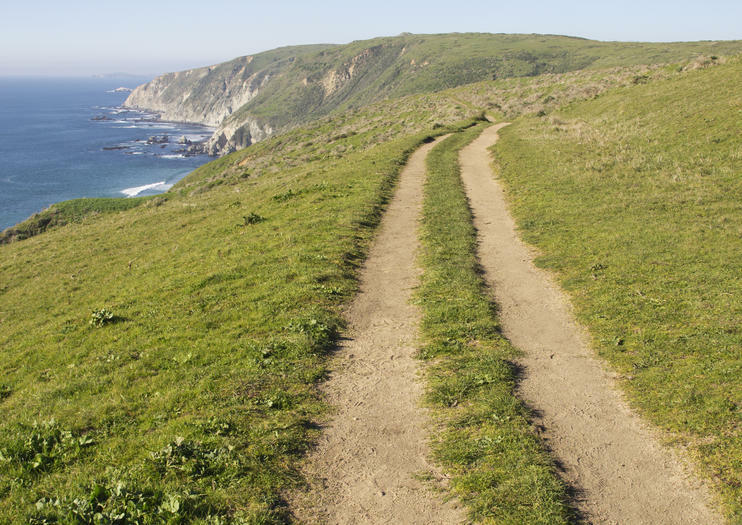 Tomales Bay Point is a hiking trail and natural park with direct access to the shoreline. The waters are typically serene and calm, making it a great spot to launch kayaks. Many bring a picnic and lounge at the beach area here, or alternately prepare for the 9.5 mile roundtrip hike through the surrounding nature. Tule elk and seabirds are common wildlife sightings. The area is a quiet escape from the nearby city of San Francisco. Tomales Bay Point can be found in the small town of Point Reyes Station. To get there take Highway 1 north from San Francisco. The drive takes about 75 minutes. Located just north of San Francisco across the Golden Gate Bridge, Marin County is well-known for its incredible artisan cuisine—and this small-group tour highlights some of its best. Sample wines and gourmet cheeses, go oyster tasting, and try fresh-baked breads as well as pastries, meats, and produce. Along the way, your guide will fill in the details of Marin’s sustainable food production, its agricultural methods and details on local history and land preservation. The tour concludes with a leisurely picnic at Tomales Bay. For a personalized experience, the tour is limited to no more than seven people. Taste your way through the scenic dairy lands of Marin County on this small-group cheese tour. Visit three local creameries to learn about the cheesemaking process firsthand. Top it all off with a gourmet picnic lunch on the banks of a picturesque pond. Numbers are limited to seven people for a personalized small-group experience.